Joan Borden was a charter member of the Orangeville Chorus and, after a brief stint on the administrative side of things, serving one year as Vice-President, she very quickly adapted to the music team where her talents continue to shine today. Beginning as bass section leader, Joan went on to become Assistant Director, and, in that role, was the recipient of the Jackie Kraft Assistant Director Award. Joan continued to enhance her education and became a Certified Director in 1997. Joan has headed up the chorus’ visual team, working closely with music and choreography. She has attended many musical education events over the years, including music schools, I.E.S., and many International conventions. She has even tried her hand at arranging. Joan Borden became a Director of the Orangeville Chorus in 2008, joining Pat Vipond, and, although she had been on the contest stage 25 times, her 2009 experience was her first in a directing role. And an exciting first experience it was – the chorus was awarded Most Improved, 2nd Place AA and 4th Place overall medals! In an unprecedented case, because the chorus achieved 605 marks in this contest, Joan became a Master Director and was awarded the Novice Director award in the same contest! This is not surprising, as Joan’s musical talents are many and varied. 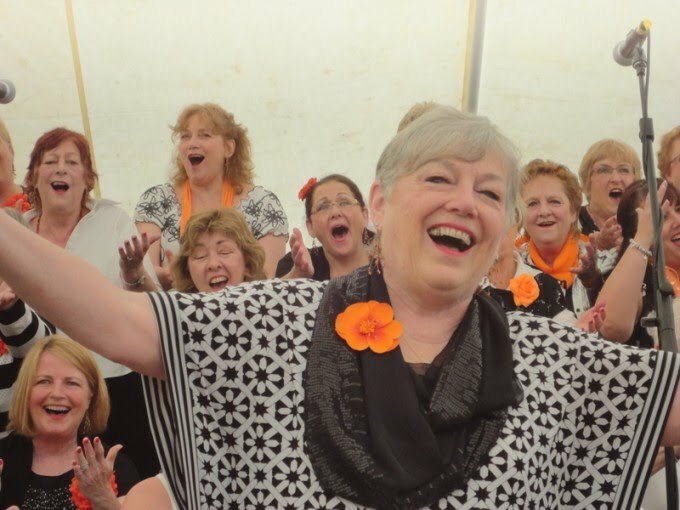 By achieving first place AA in the 2011 regional contest, with a score of 615 points, the Orangeville Chorus earned an invitation to compete in the Harmony Classic at the Sweet Adelines International convention in Denver, Colorado in October 2012. The Chorus placed 4th at this, their first appearance on the international stage! A proud moment in Joan's directing career! Joan became the sole Director of the chorus in May 2014 upon the retirement of Pat Vipond. Pat continues to sing on the risers and provides invaluable mentoring and guidance to Joan as she leads the chorus onward. Joan sings bass in the quartet, It Takes Thyme and is part of the 'Music in the Schools' programme with the rest of her quartet. She is also a member of the Dufferin Arts Council. Joan brought her barbershop skills to the Young Women in Harmony quartet, Lost in Harmony. Ages ranging from 15-18, these young women benefited directly from weekly direction, coaching and encouragement from Joan, and competed in the Sweet Adelines International Rising Star competition in Seattle in 2010 and Houston in 2011. In her other musical life, Joan sings in the Westminster United Church Senior Choir in Orangeville, and was a Director of the Theatre Orangeville Youth Singers – known as the T.O.Y.S. - for many years. She also sings in a mixed quartet – Bassically Sound – with her husband Bob, and another chorus member and her husband. Her talents are exceptional in all these ventures, from church choir to the barbershop style, and her love of harmony is obvious. A retired elementary school teacher, Joan uses those wonderful teaching skills to great advantage with the chorus. Joan and her proud and supportive husband Bob have two grown sons and six grandchildren whom they love and adore, and spoil regularly as good grandparents do! She loves to garden, and read, and enjoys travel and time with friends.